Thursday April 17 1884 I was busy all the forenoon getting our things gathered and packed up. Soon after dinner we started to the depot, stopped at Hatts awhile and they went over with us. The train was on time and our wait at West Liberty was not tedious in the least and got to Burlington on time. We stayed all night at the Barrett. Friday April 18 1884 We started from Burlington with the excursion at seven oclock, it was a cold raw damp morning but after awhile the sun came out and we had a very pleasant days ride to St. Louis. We had a wait there of time enough to get supper and a section in a palace car which we took for the rest of the journey. 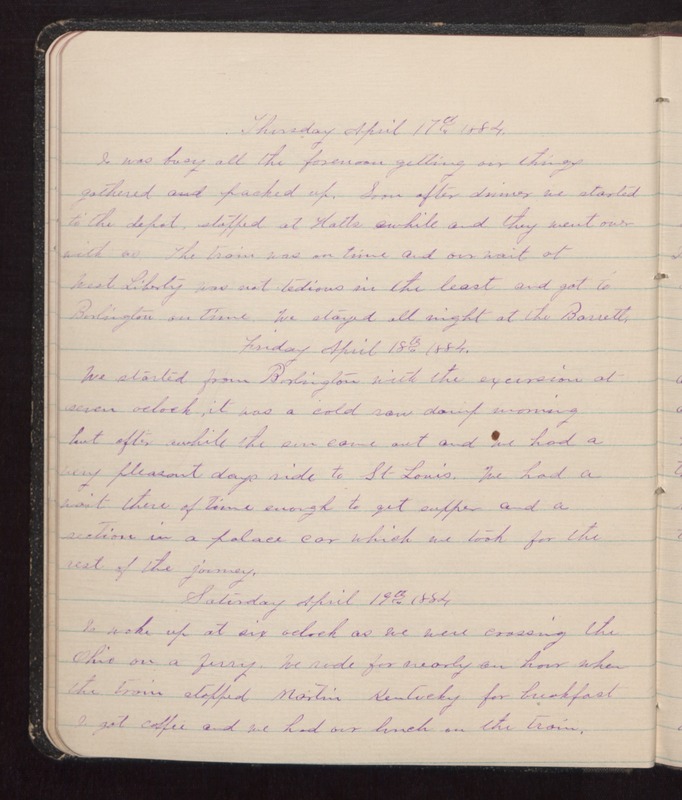 Saturday April 19 1884 I woke up at six oclock as we were crossing the Ohio on a ferry. We rode for nearly an hour when the train stopped Martin Kentucky for breakfast I got coffee and we had our lunch on the train.